Burrhus Skinner was an American philosopher, author, linguistics and physiologist. He is known for his theory of operant conditioning which means changing behaviour because of reinforcement , this is based on previous work by Edward Thorndike who studied learning in animals and used puzzles to aid his research. Thorndike’s theory was that any behaviour that is followed by a positive reaction would be repeated and any followed by a negative reaction would not, law of effect. I previously just knew this as being positive and negative reinforcement. 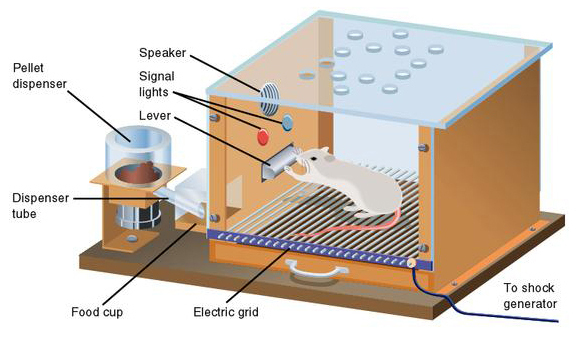 Skinner also experimented on animals and invented the ‘Skinner box’ as seen below.. Neutral Operants – Don’t increase or decrease likelihood of it been done again. Reinforces – The action is positive so increased likelihood of it been repeated. Punishers – The action is negative so is less likely to be repeated. This theory makes you question true free will because subconsciously you are normally going to repeat an action that gives you positive feedback and not repeat an action that gives you negative feedback.